Tell your clients to throw out the step ladders, you can now offer a pull down system that offers ease of use, better accessibility of the storage, a better overview of the cupboard and faster access. A product that combines both value for money and innovation is iMove from Häfele, to be featured at AWISA, Melbourne 2016. This innovative solution turns a classic overhead cabinet into an ergonomic storage system with considerable space and function. In a single effortless movement the iMove and all of its contents are pulled downwards and outwards, bringing unreachable contents within an easy to reach area. The iMove is built on proven Kesseböhmer technology and is made of high quality materials, with simply smart mechanics. 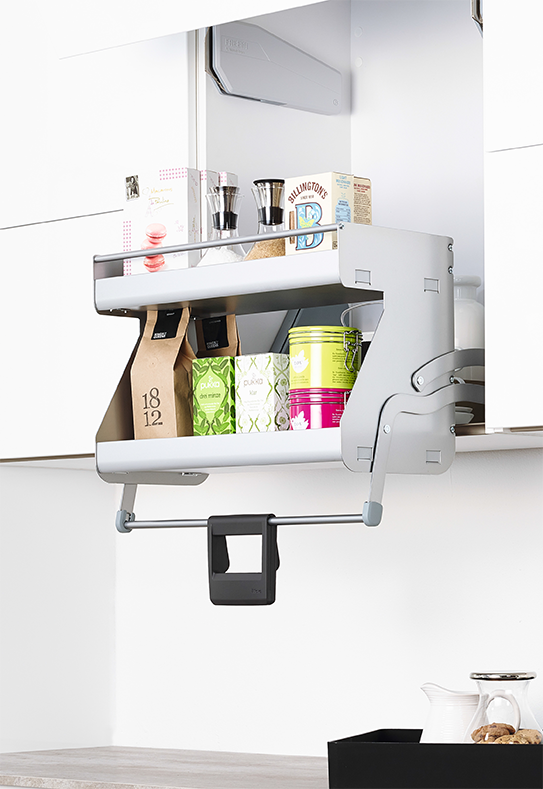 The clever use of the lever mechanism in combination with strong support springs and mounting accessories, makes iMove the ultimate in operating comfort and function, whilst proving extremely simple to assemble and install. That’s why they call it an intelligent move – iMove; It presents perfectly as an overall concept, making it an easy sell to your clients, and to ensure you get the best part of the deal it has been designed for quick, secure installation or retrofit and a lifetime of impeccable use.